One of the animal species most commonly associated with the Galapagos, the giant tortoise is a remarkable animal. 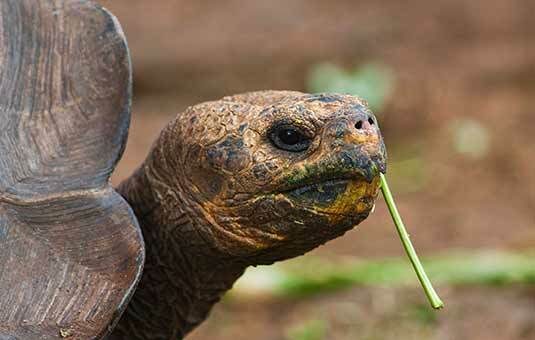 Thought to be descended from tortoises from the continent that washed ashore in Galapagos thousands of years ago, there are now several subspecies endemic to different islands. They can live for more than a hundred years and they are inextricably linked to the human history of the islands. There were once 13 different subspecies of giant tortoise on the islands. As the tortoises spread out from a common ancestor and into different islands and ecological niches, they began to adapt. Some tortoises are larger than others and capable of eating different foods, although the most visible difference is in the shape of their shells. Some have a round, dome-like shell whereas others have a saddle-shaped shell. These saddle-shaped shells in fact gave the islands their name: "galápago" is Spanish for a type of saddle. Most of the 13 subspecies evolved in isolation on different islands over thousands of years. On the largest island, Isabela, however, the tortoises evolved on the slopes of different volcanoes. Isabela island is home to five different volcanoes and five different tortoise subspecies make their homes there. The Galapagos Islands were long thought to be basically worthless: they are rocky and harsh as well as remote. Then, however, nineteenth-century whaling ships discovered that the hearty tortoises could live for months without food and water in the hold of a ship, which made them an excellent source of fresh food for sailors who might not visit shore for months at a time and who spend years scouring the seas for enough whale oil to fill their holds. Once this became known, whaling ships would regularly stop at the islands to take on supplies, including as many tortoises as they could capture. 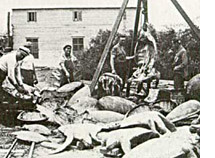 The whalers also introduced many new species to the islands, such as goats and pigs (to be caught and eaten on subsequent trips) as well as rats, cats and dogs. The combination of new species as well as being hunted by sailors led to the extinction of two subspecies: those once found on Floreana and Fernandina islands. 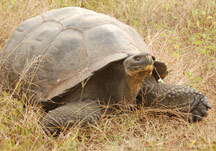 Another subspecies, the Pinta Island giant tortoise, will soon be extinct: there is only one individual left. His name is Lonesome George and he can be visited at the Charles Darwin Research Station on Santa Cruz Island. Exhaustive efforts in searching Pinta Island to find him a mate have as yet met no success, although dogged researchers continue to try. The Galapagos tortoises are herbivores (vegetarians) who dine on leaves, grass, cacti, flowers, vines and fruit: their diets differ based on what island or habitat they have evolved to fit. They move slowly and apparently aimlessly, eating what they find. They cannot swim, although they do enjoy a good soak in a muddy pool or puddle. Many of them are migratory: they move around within their habitat at different times of the year, following the rains to the greenest places where food is most abundant. As they are cold-blooded, they like to bask in the sunshine in the morning for a couple of hours before becoming active. The tortoises mate from June to December and then the female finds a sandy spot between December and May, usually near the coast, where she will lay anywhere between 18 and 28 eggs, each of which is about the size of a small tennis ball. She lays them in a hole and then covers them with sand. After 3-6 months (depending in part on what subspecies), the eggs hatch and the little turtles must dig their way out of the sand, an exhaustive process which can take up to four weeks. Some of the subspecies of giant tortoises are still endangered, having dangerously low population levels after centuries of being taken for food. Therefore, there are efforts underway to protect them. The tortoises are particularly vulnerable when they are young. Although their only natural predator is the Galapagos hawk, many introduced species such as rats, cats, dogs, pigs and even ants can make a meal out of a young tortoise. Therefore, many are raised in captivity at the Charles Darwin Research Station on Santa Cruz or in a similar facilities on Isabela or San Cristobal before being re-released into the wild when they are old and large enough to be out of danger. The easiest places to see a giant tortoise are where they are kept in cages or pens: the Charles Darwin Research Station on Santa Cruz and Galapagueras on Isabela and San Cristobal. If you want to see them in the wild, your best bet is in the misty highlands of Santa Cruz island, where they can be easily found during certain months of the year eating (best July-November), mating and relaxing in muddy pools.